It’s a good idea to know something about Python before diving into advanced DTML or any other advanced area of Zope. Understand the Zope acquisition model and how it works. If you are writing very complex functionality in DTML, consider using a Python Script. This will ease maintenance, not to mention readability. Understand the difference between a DTML Document and a DTML Method before embarking on building a huge site. See the explanation included in this chapter. It’s no lie that DTML has a reputation for complexity. While it is true that DTML is really simple if all you want to do is simple layout, using DTML for more advanced tasks requires an understanding of where DTML variables come from. This looks simple enough, the idea is, this is an HTML page that calls itself. This is because the HTML action is the URL variable, which will become the URL of the DTML Document. If there is a ‘zooName’ variable, then the page will print it, if there isn’t, it shows a form that asks for it. When you click submit, the data you enter will make the “if” evaluate to true, and this code should print what was entered in the form. But unfortunately, this is one of those instances where DTML will not do what you mean, because the name of the DTML Document that contains this DTML is also named zooName, and it doesn’t use the variable out of the request, it uses itself, which causes it to call itself and call itself, ad infinitum, until you get an “excessive recursion” error. So instead of doing what you really meant, you got an error. This is what confuses beginners. In the next couple of sections, we’ll show you how to fix this example to do what you mean. There are actually two ways to fix the DTML error in the zooName document. The first is that you can rename the document to something like zopeNameFormOrReply and always remember this special exception and never do it; never knowing why it happens. The second is to understand how names are looked up, and to be explicit about where you want the name to come from in the namespace. The DTML namespace is a collection of objects arranged in a stack. A stack is a list of objects that can be manipulated by pushing and popping objects on to and off of the stack. When a DTML Document or DTML Method is executed, Zope creates a DTML namespace to resolve DTML variable names. It’s important to understand the workings of the DTML namespace so that you can accurately predict how Zope will locate variables. Some of the trickiest problems you will run into with DTML can be resolved by understanding the DTML namespace. When Zope looks for names in the DTML namespace stack it first looks at the topmost object in the stack. If the name can’t be found there, then the next item down is introspected. Zope will work its way down the stack, checking each object in turn until it finds the name that it is looking for. As long as there is no variable named unicorn viewing this DTML will return an error, as shown in the figure below. But the DTML stack is not all there is to names because DTML doesn’t start with an empty stack, before you even begin executing DTML in Zope there are already a number of objects pushed on the namespace stack. DTML namespaces are built dynamically for every request in Zope. 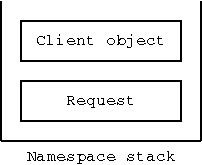 When you call a DTML Method or DTML Document through the web, the DTML namespace starts with the same first two stack elements; the client object and the request, as shown in the figure below. The client object is the first object on the top of the DTML namespace stack when entering a transaction (note: commands exist to push additional parameters onto the namespace stack during a thread of execution). What the client object is depends on whether you are executing a DTML Method or a DTML Document. In our example above, this means that the client object is named zooName. Which is why it breaks. The form input that we really wanted comes from the web request, but the client is looked at first. Here, the with tag says to look in the ‘REQUEST’ namespace, and only the ‘REQUEST’ namespace, for the name “zooName”. The client object in DTML depends on whether or not you are executing a DTML Method or a DTML Document. In the case of a Document, the client object is always the document itself, or in other words, a DTML Document is its own client object. Now, what this method displays depends upon how it is used. If you apply this method to the Reptiles folder with the URL ‘http://localhost:8080/Reptiles/list’, then you will get something that looks like the figure below. But if you were to apply the method to the Birds folder with the URL http://localhost:8080/Birds/list then you would get something different, only two items in the list, Parrot and Raptors. Same DTML Method, different results. 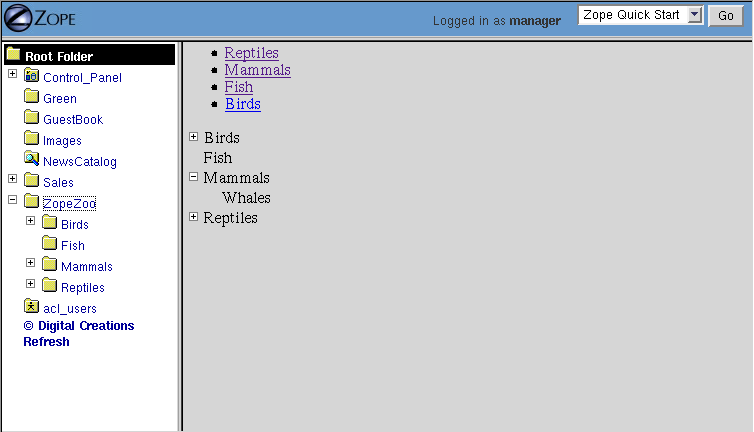 In the first example, the client object of the list method was the Reptiles folder. In the second example, the client object was the Birds folder. When Zope looked up the objectValues variable, in the first case it called the objectValues method of the Reptiles folder, in the second case it called the objectValues method of the Birds folder. In other words, the client object is where variables such as methods, and properties are looked up first. As you saw in “Dynamic Content with DTML”, if Zope cannot find a variable in the client object, it searches through the object’s containers. Zope uses acquisition to automatically inherit variables from the client object’s containers. So when Zope walks up the object hierarchy looking for variables it always starts at the client object, and works its way up from there. use a DTML Document since DTML Methods have no inherent properties. consider using a DTML Document since it will be easier to control such items as page title by using properties. you should probably use a DTML Method since these objects act as though they are directly attached to their calling, or containing object. The request object is the bottom object on the DTML namespace stack. The request contains all of the information specific to the current web request. The CGI environment. The Common Gateway Interface, or CGI interface defines a standard set of environment variables to be used by dynamic web scripts. These variables are provided by Zope in the REQUEST namespace. Form data. If the current request is a form action, then any form input data that was submitted with the request can be found in the REQUEST object. Cookies. If the client of the current request has any cookies these can be found in the current REQUEST object. Additional variables. The REQUEST namespace provides you with lots of other useful information, such as the URL of the current object and all of its parents. The request namespace is very useful in Zope since it is the primary way that clients (in this case, web browsers) communicate with Zope by providing form data, cookies and other information about themselves. For more information about the request object, see Appendix B. Try this yourself, you should get something that looks like the figure below. Since the request comes after the client object, if there are names that exist in both the request and the client object, DTML will always find them first in the client object. This can be a problem. Next, let’s look at some ways to get around this problem by controlling more directly how DTML looks up variables. When you insert a variable using the var tag, Zope first looks up the variable using the DTML namespace, it then renders it and inserts the results. Rendering means turning an object or value into a string suitable for inserting into the output. Zope renders simple variables by using Python’s standard method for coercing objects to strings. For complex objects such as DTML Methods and SQL Methods, Zope will call the object instead of just trying to turn it into a string. This allows you to insert DTML Methods into other DTML Methods. In general Zope renders variables in the way you would expect. It’s only when you start doing more advanced tricks that you become aware of the rendering process. Later in this chapter we’ll look at some examples of how to control rendering using the ‘getitem’ DTML utility function. Now that you know the DTML namespace is a stack, you may be wondering how, or even why, new objects get pushed onto it. Some DTML tags modify the DTML namespace while they are executing. A tag may push some object onto the namespace stack during the course of execution. These tags include the in tag, the with tag, and the let tag. You’ve seen this many times throughout the examples in this book. While the in tag is iterating over a sequence, each item is pushed onto the namespace stack for the duration of the contents of the in tag block. When the block is finished executing, the current item in the sequence is popped off the DTML namespace stack and the next item in the sequence is pushed on. sequence-item: The current item within the iteration. sequence-start: True if the current item is the first item in the sequence. sequence-length: The length of the sequence. previous-sequence: True on the first iteration if the current batch is not the first one. Batch size is set with the size attribute. next-sequence: True on the last iteration if the current batch is not the last batch. There are many more variables available when using the in tag. See Appendix A for more detail. The with tag pushes an object that you specify onto the namespace stack for the duration of the with block. This allows you to specify where variables should be looked up first. When the with block closes, the object is popped off the namespace stack. This will ensure that you get the form’s id first. See Appendix B for complete API documentation of the request object. Using the only attribute allows you to be sure about where your variables are being looked up. The let tag accomplishes much of the same goals as the with tag. The main advantage of the let tag is that you can use it to define multiple variables to be used in a block. The let tag creates one or more new name-value pairs and pushes a namespace object containing those variables and their values on to the top of the DTML namespace stack. In general the with tag is more useful to push existing objects onto the namespace stack, while the let tag is better suited for defining new variables for a block. When you find yourself writing complex DTML that requires things like new variables, there’s a good chance that you could do the same thing better with Python or Perl. Advanced scripting is covered in the chapter entitled Advanced Zope Scripting . The DTML namespace is a complex place, and this complexity evolved over a lot of time. Although it helps to understand where names come from, it is much more helpful to always be specific about where you are looking for a name. The ‘with’ and ‘let’ tags let you alter the namespace in order to obtain references to the objects you need. Like all things in Zope, the DTML namespace is an object, and it can be accessed directly in DTML with the _ (underscore) object. The _ namespace is often referred to as “the under namespace”. The under namespace provides you with many useful methods for certain programming tasks. Let’s look at a few of them. ‘len’ returns the size of sequence as an integer. Many of these names come from the Python language, which contains a set of special functions called ‘built-ins’. The Python philosophy is to have a small number of built-in names. The Zope philosophy can be thought of as having a large, complex array of built-in names. Remember, everything inside a Python expression attribute must be a valid Python expression. In DTML, sequence-item is the name of a variable, but in Python this means “The object sequence minus the object item”. This is not what you want. The prefix attribute causes in tag variables to be renamed using the specified prefix and underscores, rather than using “sequence” and dashes. So in this example, “sequence-item” becomes “loop_item”. See Appendix A for more information on the prefix attribute. The getitem function takes the name to look up as its first argument. Now, the DTML Method will correctly display the square of the first three integers. The getitem method takes an optional second argument which specifies whether or not to render the variable. Recall that rendering a DTML variable means turning it into a string. By default the getitem function does not render a variable. Notice in the above example that selectedDoc is not in quotes. We don’t want to insert the text selectedDoc we want to insert the value of the variable named selectedDoc. For example, the value of selectedDoc might be ‘chapterOne’. Using this method, you can look up an item using a dynamic value instead of static text. If you are a python programmer and you begin using the more complex aspects of DTML, consider doing a lot of your work in Python scripts that you call from DTML. This is explained more in the chapter entitled Advanced Zope Scripting. Using Python sidesteps many of the issues in DTML. 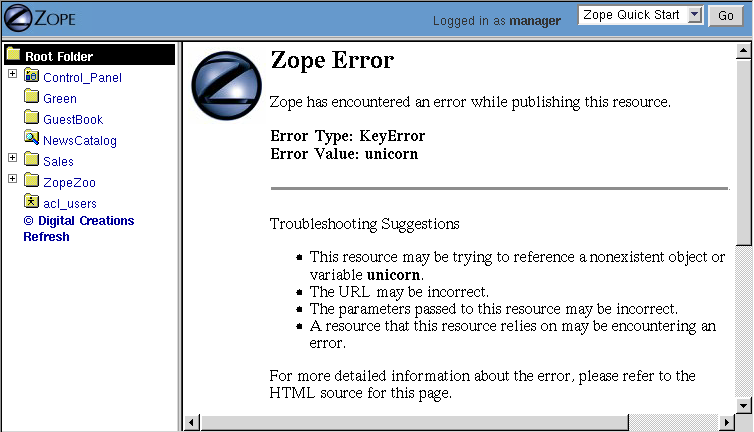 Zope can be used by many different kinds of users. For example, the Zope site, Zope.org, has over 11,000 community members at the time of this writing. Each member can log into Zope, add objects and news items, and manage their own personal area. Because DTML is a scripting language, it is very flexible about working with objects and their properties. If there were no security system that constrained DTML then a user could potentially create malicious or privacy-invading DTML code. DTML is restricted by standard Zope security settings. So if you don’t have permission to access an object by going to its URL you also don’t have permission to access it via DTML. You can’t use DTML to trick the Zope security system. DTML verifies that the current user is authorized to access all DTML variables. If the user does not have authorization, then the security system will raise an Unauthorized error and the user will be asked to present more privileged authentication credentials. In the chapter entitled Users and Security , you read about security rules for executable content. There are ways to tailor the roles of a DTML Document or Method to allow it to access restricted variables regardless of the viewer’s roles. DTML will not let you gobble up memory or execute infinite loops and recursions. Because the restrictions on looping and memory use are relatively tight, DTML is not the right language for complex, expensive programming logic. For example, you cannot create huge lists with the _.range utility function. You also have no way to access the filesystem directly in DTML. Keep in mind however that these safety limits are simple and can be outsmarted by a determined user. It’s generally not a good idea to let anyone you don’t trust write DTML code on your site. In the rest of this chapter we’ll look at the many advanced DTML tags. These tags are summarized in Appendix A. DTML has a set of built-in tags, as documented in this book, which can be counted on to be present in all Zope installations and perform the most common kinds of things. However, it is also possible to add new tags to a Zope installation. Instructions for doing this are provided at the Zope.org website, along with an interesting set of contributed DTML tags. This section covers what could be referred to as Zope miscellaneous tags. These tags don’t really fit into any broad categories except for one group of tags, the exception handling DTML tags which are discussed at the end of this chapter. The var tag can call methods, but it also inserts the return value. Using the call tag you can call methods without inserting their return value into the output. This is useful if you are more interested in the effect of calling a method rather than its return value. In this example, the page will change a property depending on whether a certain name exists. The result of the manage_changeProperties method is not important and does not need to be shown to the user. In short, the call tag works exactly like the var tag with the exception that it doesn’t insert the results of calling the variable. are NEVER sent to the client. The comment block is removed from DTML output. In addition to documenting DTML you can use the comment tag to temporarily comment out other DTML tags. Later you can remove the comment tags to re-enable the DTML. The tree tag lets you easily build dynamic trees in HTML to display hierarchical data. A tree is a graphical representation of data that starts with a “root” object that has objects underneath it often referred to as “branches”. Branches can have their own branches, just like a real tree. This concept should be familiar to anyone who has used a file manager program like Microsoft Windows Explorer to navigate a file system. And, in fact, the left hand “navigation” view of the Zope management interface is created using the tree tag. For example here’s a tree that represents a collection of folders and sub-folders. The tree tag queries objects to find their sub-objects and takes care of displaying the results as a tree. The tree tag block works as a template to display nodes of the tree. Now, since the basic protocol of the web, HTTP, is stateless, you need to somehow remember what state the tree is in every time you look at a page. To do this, Zope stores the state of the tree in a cookie. Because this tree state is stored in a cookie, only one tree can appear on a web page at a time, otherwise they will confusingly use the same cookie. You can tailor the behavior of the tree tag quite a bit with tree tag attributes and special variables. Here is a sampling of tree tag attributes. The name of the method used to find sub-objects. This defaults to tpValues, which is a method defined by a number of standard Zope objects. The name of a method used to display objects that do not have sub-object branches. Either 0 or 1. If 0, then branch text will wrap to fit in available space, otherwise, text may be truncated. The default value is 0. Sort branches before text insertion is performed. The attribute value is the name of the attribute that items should be sorted on. Either 0 or 1. If 1, then all objects are assumed to have sub-objects, and will therefore always have a plus sign in front of them when they are collapsed. Only when an item is expanded will sub-objects be looked for. This could be a good option when the retrieval of sub-objects is a costly process. The defalt value is 0. Either 0 or 1. If 1, then only one branch of the tree can be expanded. Any expanded branches will collapse when a new branch is expanded. The default value is 0. Either 0 or 1. If 1, then no errors will be raised trying to display sub-objects for which the user does not have sufficient access. The protected sub-objects are not displayed. The default value is 0. Suppose you want to use the tree tag to create a dynamic site map. You don’t want every page to show up in the site map. Let’s say that you put a property on folders and documents that you want to show up in the site map. This DTML Method draws a link to all public resources and displays them in a tree. Here’s what the resulting site map looks like. For a summary of the tree tag arguments and special variables see Appendix A. In general DTML creates textual output. You can however, make DTML return other values besides text. Using the return tag you can make a DTML Method return an arbitrary value just like a Python or Perl-based Script. This DTML Method returns the number 42. Another upshot of using the return tag is that DTML execution will stop after the return tag. If you find yourself using the return tag, you almost certainly should be using a Script instead. The return tag was developed before Scripts, and is largely useless now that you can easily write scripts in Python and Perl. The sendmail tag formats and sends a mail messages. You can use the sendmail tag to connect to an existing Mail Host, or you can manually specify your SMTP host. you can build unimaginable wealth very quickly. Act now! 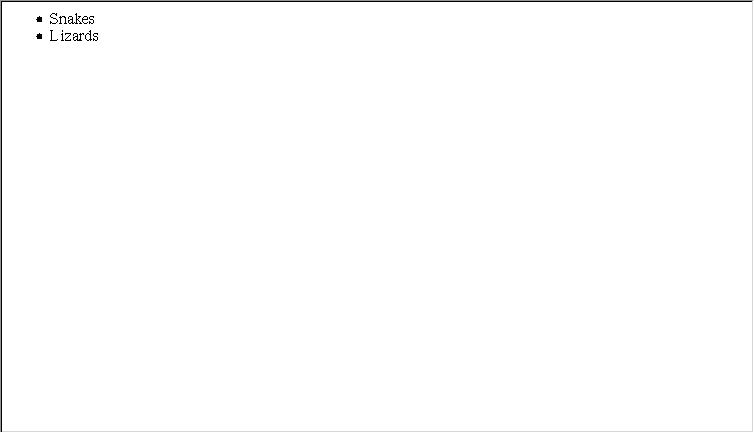 Notice that there is an extra blank line separating the mail headers from the body of the message. A common use of the sendmail tag is to send an email message generated by a feedback form. The sendmail tag can contain any DTML tags you wish, so it’s easy to tailor your message with form data. The mime tag allows you to format data using MIME (Multipurpose Internet Mail Extensions). MIME is an Internet standard for encoding data in email message. Using the mime tag you can use Zope to send emails with attachments. Suppose you’d like to upload your resume to Zope and then have Zope email this file to a list of potential employers. This method iterates over the sendto variable and sends one email for each item. 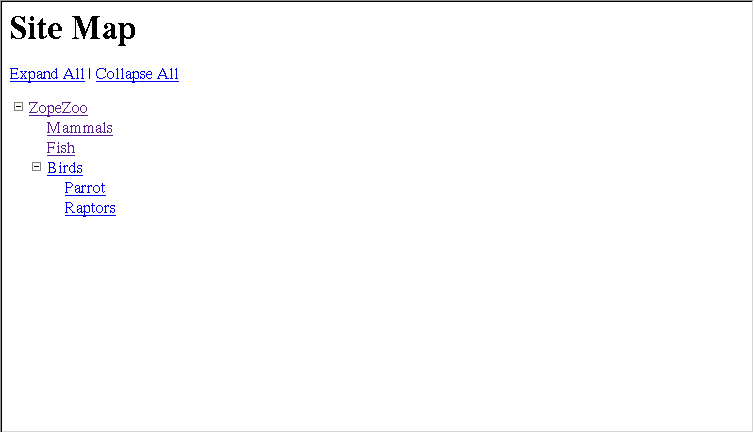 Notice that there is no blank line between the ‘To:’ header and the starting mime tag. If a blank line is inserted between them then the message will not be interpreted as a multipart message by the receiving mail reader. Also notice that there is no newline between the boundary tag and the var tag, or the end of the var tag and the closing mime tag. This is important, if you break the tags up with newlines then they will be encoded and included in the MIME part, which is probably not what you’re after. As per the MIME spec, mime tags may be nested within mime tags arbitrarily. What is the purpose of the unless tag? It is simply a convenience tag. The unless tag is more limited than the if tag, since it cannot contain an else or elif tag. The Easter Bunny does not exist or is not true. The Easter Bunny is not true. This example will raise an exception if the_easter_bunny does not exist. Anything that can be done by the unless tag can be done by the if tag. Thus, its use is totally optional and a matter of style. Often you want to present a large list of information but only show it to the user one screen at a time. For example, if a user queried your database and got 120 results, you will probably only want to show them to the user a small batch, say 10 or 20 results per page. Breaking up large lists into parts is called batching. Batching has a number of benefits. o The user only needs to download a reasonably sized document rather than a potentially huge document. This makes pages load faster since they are smaller. o Because smaller batches of results are being used, often less memory is consumed by Zope. o Next and Previous navigation interfaces makes scanning large batches relatively easy. Let’s take a look at the DTML to get an idea of what’s going on. First we have an in tag that iterates over 100 numbers that are generated by the range utility function. The size attribute tells the in tag to display only 10 items at a time. The start attribute tells the in tag which item number to display first. Inside the in tag there are two main if tags. The first one tests special variable ‘sequence-start’. This variable is only true on the first pass through the in block. So the contents of this if tag will only be executed once at the beginning of the loop. The second if tag tests for the special variable ‘sequence-end’. This variable is only true on the last pass through the in tag. So the second if block will only be executed once at the end. The paragraph between the if tags is executed each time through the loop. Inside each if tag there is another if tag that check for the special variables ‘previous-sequence’ and ‘next-sequence’. The variables are true when the current batch has previous or further batches respectively. In other words ‘previous-sequence’ is true for all batches except the first, and ‘next-sequence’ is true for all batches except the last. So the DTML tests to see if there are additional batches available, and if so it draws navigation links. The batch navigation consists of links back to the document with a query_start variable set which indicates where the in tag should start when displaying the batch. To better get a feel for how this works, click the previous and next links a few times and watch how the URLs for the navigation links change. This quick and easy method to display pages is a nice navigational tool for larger batches. It does present the drawback of having to utilize an additional dtml-in tag to iterate through the actual items, however. Batch processing can be complex. A good way to work with batches is to use the Searchable Interface object to create a batching search report for you. You can then modify the DTML to fit your needs. This is explained more in the chapter entitled Searching and Categorizing Content. In this section are several useful examples of dtml code. While many of these are most often better done in Python scripts, there are occasions when knowing how to accomplish this in dtml is worthwhile. This code looks up the name of the desired dtml-method in the lookup table (contained in the let statement) and in turn, looks up the name of this dtml-method in the current namespace. As long as the dtml-method exists, control will be passed to the method directly. This example could be made more complete with the addition of exception handling which was discussed above. whether the sort should be ascending or descending. It’s as simple as that. Often this is very useful if you wish to forward a request and significant processing is needed to determine which dtml object is the target. Occasionally it is useful to “turn off” acquisition when looking up an attribute. In this example, you have a folder which contains sub-folders. Each sub-folder contains Images. The top-level folder, each subfolder, and each image contain a property named desc. If you were to query the Image for its desc property it would return the desc property of it’s parent folder if the Image did not have the property. This could cause confusion as the Image would appear to have the desc property when it really belonged to the parent folder. In most cases, this behavior is desired. However, in this case, the user would like to see which images have the desc property and which don’t. This is accomplished by utilizing aq_explicit in the call to the object in question. As you can see, this can be very useful. DTML provides some very powerful functionality for designing web applications. In this chapter, we looked at the more advanced DTML tags and some of their options. A more complete reference can be found in Appendix A. The next chapter teaches you how to become a Page Template wizard. While DTML is a powerful tool, Page Templates provide a more elegant solution to HTML generation.